I saw Die Walküre last Saturday and read the Times review the next day. I have to say, the Times and other reviewers really need to get off their high horses about Robert Lepage’s “machine,” as they call it. Anthony Tommasini at the Times describes the apparatus as a “45-ton set consisting of 24 rotating planks” and then proceeds to rip it to shreds. “Some of the most sublimely beautiful music ever written becomes background for an art installation,” he sniffs. Get over it. By fixating on the machine, you critics are doing exactly what you persistently complain that the machine is doing: concentrating on stagecraft rather than the music. 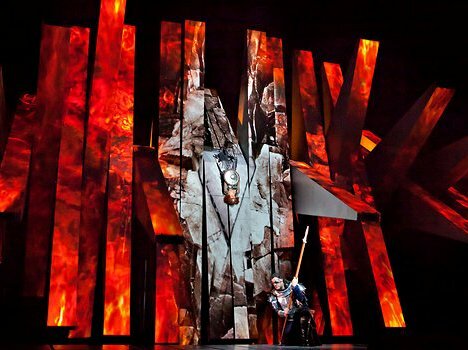 Yes, I will concede that the “aerial view” of the fiery mountaintop (pictured above) at the end was gimmicky and did distract the audience from the music (as the gasps across the orchestra section would indicate), but no where does the review mention how beautifully the planks depicted the forest, or Hunding’s forbidding home. Besides, such sneering does a disservice to what many would consider a dying art form. I haven’t the faintest clue why opera critics would relentlessly, and I think unfairly, mock their own bread and butter. Those continuing to do so may soon find themselves grousing in an empty auditorium. Enough of my own grousing and onto other thoughts. The Siegmund switcheroo in Act I was a bit unnerving, and I wished that the Met decided to retire the ailing Simon O’Neill for the show rather than letting him exhaust himself first before finally swapping in Andrew Sritheran mid-scene. Nonetheless, I thought that the understudy did a remarkable job of seamlessly integrating himself into the cast. His voice may not have been as powerful as O’Neill’s might have been if not for his early morning allergy attack, but I thought that Sritheran’s athletic build and energy gave much-needed vitality to the role. I found Martina Serafin’s voice strong and clear, and her acting subtle in the opening minutes. But by the end of Act I, perhaps under the influence of a sturdier Siegmund, Sieglinde seemed to explode with drama, and not in a good way. Her quivering on the planks, awkward two-handed-backward grasping of the Northung sword, and staggering around the edge of the stage were all too much for me, and certainly too much for the oppressed character. It was hard not to chuckle. Whoever directed her to act like that is better off directing a second-grade adaptation of Hamlet. Mark Delavan succesfully portrayed a commanding but conflicted Wotan. Deborah Voigt as Brünnhilde was as plucky and bright as she always has been in these productions. Stephanie Blythe as Fricka was a perfectly spiteful and forceful goddess, as she was last season. And the $15 plastic glasses of prosecco at the bar were as delicious and exorbitant as ever.